AlphaNinja: Lululemon (LULU) and the trouble with price targets. 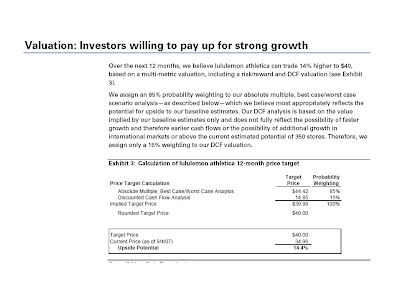 Lululemon (LULU) and the trouble with price targets. AlphaNinja - I constantly refer to the valuation metric FCFY, or Free Cash Flow Yield(as a % of market valuation). One of the main reasons I do so is because the last few years have been brutal to stockpickers who've relied on picking the right PE ratio, or the proper cost of capital in a DCF model. 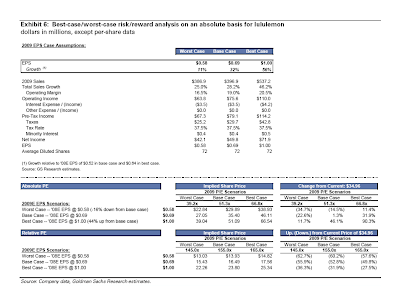 In many instances the earnings and cash flow projections have been reasonably accurate, but the other variables that go into the stock target have proved to be largely arbitrary. So here's Lululemon as an example of a stock people wanted to own, and struggled to value reasonably. LULU is a women's athletic retailer, selling pricy but high-quality athletic apparell at 113 stores in the USA and Canada. As Weisel put it in September 2007, "the brand has rapidly developed a cult-like following among fashionable, fitness oriented women due primarily to its superior product. The firm believes the co can grow to 300 locations in North America eventually. The brand is still young in the U.S. but they believe awareness will increase significantly over the coming years." Or as Cramer said, in his understated manner, "he believes lululemon (LULU) has growth potential as a woman's apparel retailer. Therefore, its addressable market is 50% of the population." 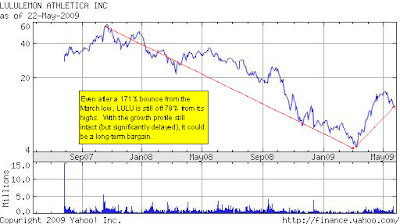 LULU went public July 27th 2007 at $18 per share, and by the fall had traded to almost $60. The main "story" with this stock was a potential North American presence of 350 stores, with an operating margin of 19-20%. At maybe $4.5million annually per store, that's $1.4billion in revenue and about $175million in net income. The only way the $40-and-up price targets could be even close to justified was by citing the company's huge growth plans, which at the time were 25-35 stores annually. Today, management still plans on getting to 300 stores, and based on what they've shown so far I think their 19-20% operating margin is attainable also. But they're growing the store base 6% this year, with comps(sales at stores open at least one year) running negative double digits. That 300 stores and $1.4 billion or so in sales is way, way off in the future, as are free cash flows of any significance. The main point here is that modeling the downside of growth estimates is equally, or more important, than the chance of upside surprises. If the economy gets going even a little, LULU's 2011 estimates might quickly head to over 1.00 in EPS, sending the stock to $20. However as a free-cash-flow investor, I'll stay on the sidelines for now.